ASUS teases 'miracle' device, ‘Pad and Phone’ come together: will we see a new PadFone? Asus is teasing something big for MWC: a ‘metallic miracle’ of a device made with ‘ultimate craftsmanship’ and judging by the strong video hint below, we could well see the new PadFone. “Join us on February 25, when Pad and Phone come together,” Asus posted on its official webpage. 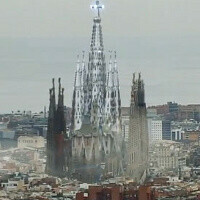 The teaser video is captivating showing Barcelona’s beautiful Sagrada Familia invaded by aliens. It doesn’t make much sense, but Asus will release another teaser tomorrow, so stay tuned for that. What would you like to see from Asus? And what would the ideal third-generation Padfone look like? Sound off in the comments below. Love to see a pad that can dock with any android phone! dreaming? all android phones dont have a standard dock connector for that to be possible. All gadgets in brushed aluminum! ...My iPad3, my 13" Macbook Pro, in March my next SuperPhone (the new HTC One obviously) & what's next Asus? Asus devices are pretty good. This would be great but we won't see any Ubuntu phones in 2013 right? So I feel like this year's MWC would be a bit to early for that announcement. Man, it´s not aliens or anything like that. The "Sagrada Familia" it´s an unfinished work. The part that ASUS is teasing with is the last and final part of the project that is still to be built (from Gaudí original plan)http://upload.wikimedia.org/wikipedia/commons/2/2f/Sagrada_Familia_%28maqueta%29.jpg So the tease is about "creating the ultimate form" of a great project. Wow, how were you aware of that?! I cant wait for the PadFone 3! I just hope that Asus releases it in the US this time.